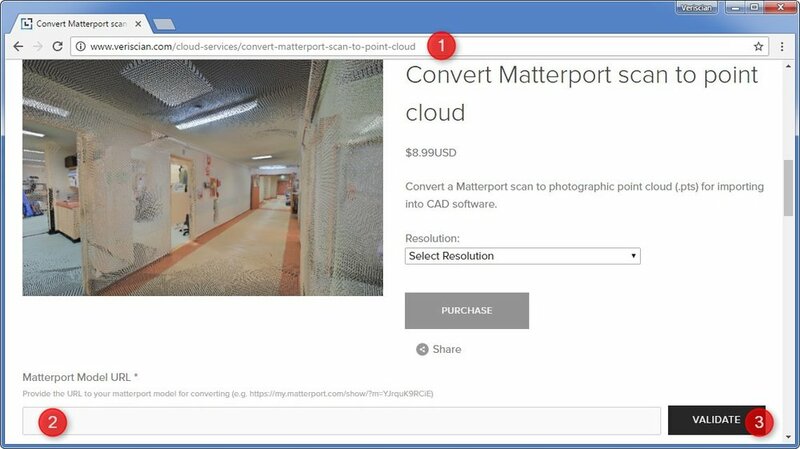 1) Navigate to cloud services select from the available Matterport conversions. Available options include; Matterport to Point Cloud, Matterport to 3DS Max, Matterport to FBX file. 3) Select "validate", this will check to see if your Matterport model is public. 4) Check the validated detail to ensure the chosen Matterport model is correct. If the chosen Matterport model is not set to public, and error message will be returned. 5) Select "change" to modify the chosen Matterport embed url. 6) Select from any additional options available for customization. For Matterport to Point Cloud, it is possible to select the desired density of your point cloud. Once all options have been set, select "purchase". 7) A new form will appear. Confirm once again that the chosen Matterport model is correct and change if necessary. 8) Upload your Matterport OBJ file by dragging and dropping it on the upload area. Alternatively, select "Choose File..." and navigate to the OBJ file. 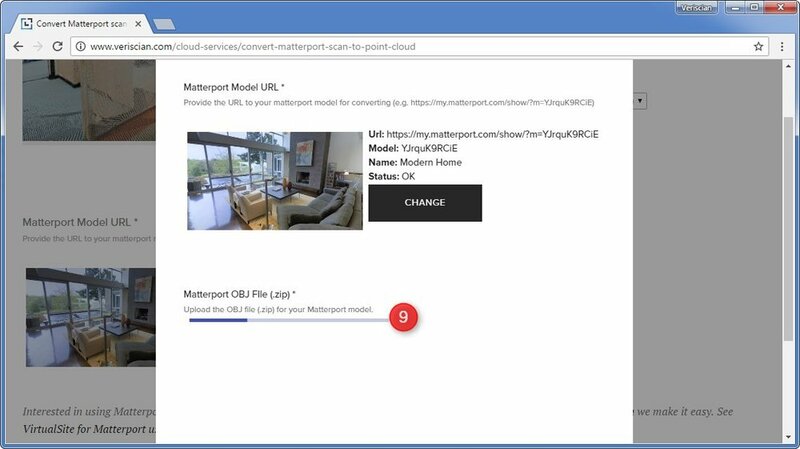 The OBJ file can be downloaded directly from the model page within your Matterport Cloud account. See how to download a Matterport OBJ file for a model for more detail. 9) Wait for the Matterport OBJ file to finish uploading. You can monitor progress via the loading bar. 10) The uploaded Matterport OBJ file should now be visible. To change the uploaded file, select the "cross" icon to delete the uploaded file and start again. 11) Provide an email address to be sent the final output. Once the conversion is complete, this email address will be sent an email containing a link to download the converted file. This download link will remain active for 7 days. 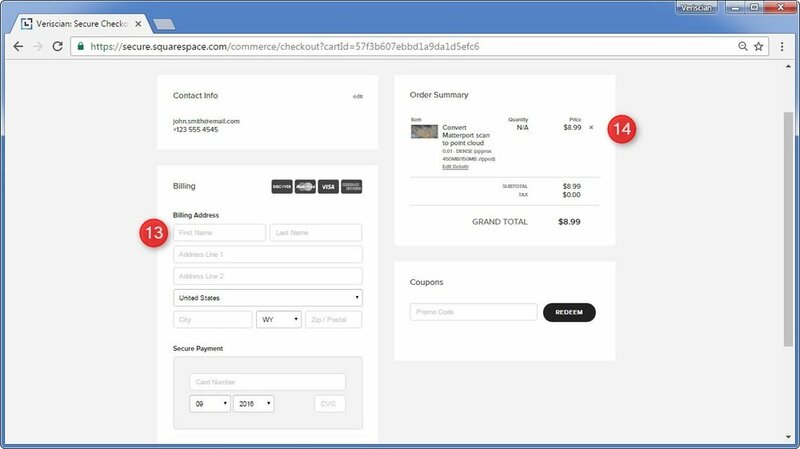 12) Select "purchase" to proceed to check out. 13) Complete the checkout form with your billing details. 14) Check to ensure your final order is correct, and submit.